Is a lie a lie if everybody knows it’s a lie? This question appears on the screen in the beginning of the movie but if you expect that the answer will be revealed soon, you are going to be disappointed. Officially this movie is about the fight between magicians and FTB’s agents. But in fact this fight is among main characters’ egos. Every character appears to have the enormous ego and it is very interesting to guess who will be crushed his or hers ego first. The script basically isn’t very tricky. Four magicians get together and start doing magic tricks. However, they are brought together by the mysterious fifth person who is hiding somewhere behind the curtain. This team makes amazing tricks together. During one show they rob the bank and naturally it makes FTB’s agents and Interpol furious. Witch-hunt has started. Who doesn’t like good tricks? It is really hard to say who will not like this movie because it is full of everything! There are gorgeous tricks, tricky brain teasers, talented actors, delicate humor, round-up and scrambles… In other words, there is everything that should be in a good thriller. The pace of this movie is very fast from the first seconds. We are given just a few minutes for all “the dots on the ‘I’”. It’s good. It’s nice when you don’t want to look at your watch. You just enjoy the show. The actors chosen for the main parts are talented (Isla Fisher, Morgan Freeman, Mark Ruffalo, Dave Franco, Michael Caine) and real professionals but it look like they didn’t have a chance to do their best. There are so many tricks and adventures that we can’t see characters clearly and they become stereotypical. We have no time to know them better. We just realize that they live colorful lives. On the other hand, we are able to observe what kind of people they are now and guess about their early lives. And the fact that they look stereotypical doesn’t make them less interesting. “Now You See Me” – movie which is definitely worth seeing. This movie will involve you and keep you hooked up till the end. Probably you will even want to watch this movie one more time. This world is full of falseness and paralyzing self-confidence. It is pleasure not only to see this world but also to feel a part of it. 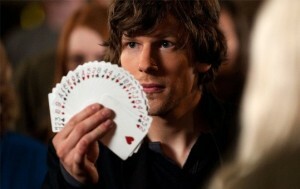 And even though the creators of “Now You See Me” will trick you many times you will not get angry. You will respect them for that. Anyway, despite the fact that this movie makes a big impression it will not stay in your head for a long time. Probably you would not recommend this movie for your friend after a week later just because you will remember neither the movie nor its characters.